Is there a caregiver in your family? For example, someone who looks out for an elderly parent or grandparent – or who cares for a child or spouse with a debilitating illness? November is National Family Caregivers Month, a time for recognizing the important role of family caregivers in our society as well as the challenges they face on a daily basis. Currently more than 65 million Americans (or approximately 29% of the US population) are serving in a caregiver role in any given year, averaging 20 hours per week. Approximately 66% are women. The value of services these caregivers provide for “free” when caring for older adults is estimated to be $375 billion per year. Yet what many people may not think about is the economic and health impact on the family caregiver. Financially, caregiving families have median incomes that are 15% lower than non-caregiving families, and women caregivers are 2.5 times more likely to live in poverty than non-caregivers. In terms of health and well-being, approximately 40 to 70% of caregivers report clinically significant symptoms of depression, according to one study, while 55% say they skip doctor appointments for themselves. Read other eye-opening caregiver statistics here. PatientsLikeMe strives to support and involve caregivers with our “CareTeam” concept, which was developed to include everyone who participates in the care of our patient members. That could be a spouse/partner, parent, child, doctor, therapist, home health worker, sibling, relative or friend. 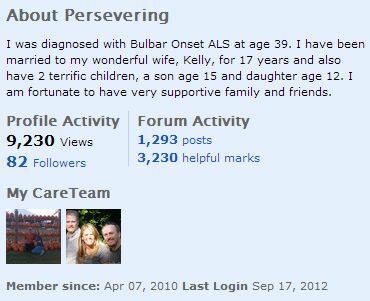 Patients can invite caregivers to join PatientsLikeMe, and once they are members, send them a CareTeam invite to link together their profiles. That way, both the patient and caregiver can stay abreast of how the other is doing physically, emotionally and socially. Currently, there are more than 7,000 caregivers registered with PatientsLikeMe, many of whom are active users of our forums, who chart their own symptoms and treatments and who are seeking information, guidance and support directly from patients or other caregivers. Browse their profiles – even if they have no specific health issues, caregivers can monitor their well-being with tools like our InstantMe and Quality of Life surveys – and find out what their life is like today.